With an ever-growing population, society requires an increase in consumer goods. Companies need to be able to reach a larger audience in a shorter time period. Unfortunately, the traditional supply chain negatively affects the environment. While the general public is happy with customer service and their products, it may not realize how these items are being made. The manufacturing and distribution of goods may produce greenhouse gases, release toxins into the air and ground and use finite resources. However, not every company is sticking to the practices it knows. Corporations such as General Mills are working to not only provide premium customer service, but also reduce their carbon footprints. On Monday, General Mills announced it would reduce its greenhouse gas emissions throughout the supply chain by 28 percent in the next decade, The Associated Press reported. The company will also work to implement more clean energy sources and ensure its global sourcing is completely organic. These actions are the corporation's attempt at reducing its impact on the environment, as Mother Nature's decline negatively affects General Mills' supplies, production, sales and customers. The company is the first to do so throughout the supply chain, as many just focus on the property they own. "We think that human-caused greenhouse gas causes climate change and climate volatility and that's going to stress the agricultural supply chain, which is very important to us," Ken Powell, CEO of General Mills, told the source. "Obviously we depend on that for our business, and we all depend on that for the food we eat." Unfortunately, it may be slightly more difficult to implement change than simply investing $100 million in renewable energy. General Mills does not have sole control over every aspect of its supply chain, and the company estimated that its independent parts produce 92 percent of the business's pollutants, The Associated Press explained. Powell believes the size of General Mills will aid in encouraging suppliers to make their practices more eco-friendly. The corporation has partnered with its suppliers that have already made changes to determine the best course of action in cleaning up the entire supply chain, according to the source. General Mills will work on making its packaging, vehicles and workflow more efficient and environmentally friendly. 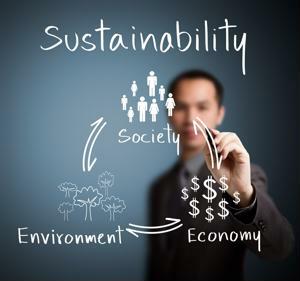 While consumer and business practices today are efficient and cost-effective, they aren't always eco-friendly. According to the U.S. Environmental Protection Agency, humans have the largest negative impact on the environment. Burning fossil fuels, deforestation, and large-scale farming practices release countless amounts of greenhouse gases into the air and reduce the Earth's ability to repair the damage. Despite some companies and people doing their best to switch to sustainable practices, they can't save the planet without help. However, critics of global warming and climate change stand in the way. They have claimed that the annual heating of the planet has slowed or has gone on hiatus, but that isn't the case. In a study published in Science, researchers from the National Oceanic and Atmospheric Administration's National Centers for Environmental Information found that global warming hasn't slowed at all, The Washington Post reported. The investigators made efforts to eliminate biases that had been present in other surveys by only using buoy thermometers instead of ships' measurements for ocean temperatures and using more land-based thermometers. This showed more accurate data than had previous been viewed. However, this still faces criticism. It doesn't matter if global warming is as serious as scientists claim, the Earth still has a limited number of resources. By creating a more sustainable supply chain, companies will be able to make those reserves last longer.